Steak and potatoes is such an all-American meal. Unless it’s steak frites, in which case it’s all-French. Both are sublime if you’re a carnivore – which I am – and so last night’s dinner made me very happy. Steak for us is usually a weekend meal. A Saturday-night-excuse-to-open-a-big-red sort of dinner rather than an it’s-7:00-and-you-still-haven’t-left-work Thursday night situation. 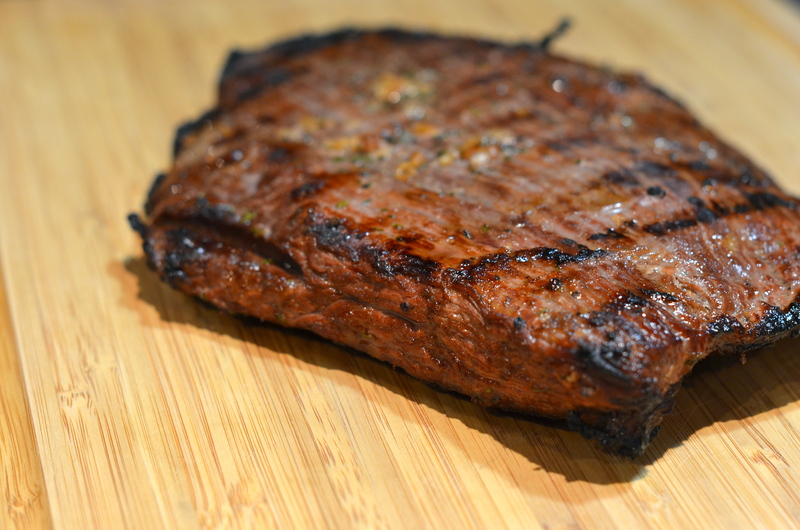 But cooking a steak is actually really easy and not particularly time-consuming for a weeknight. Especially when it’s a flank steak that has been bathing in marinade all day anticipating its flamey demise on the Weber. 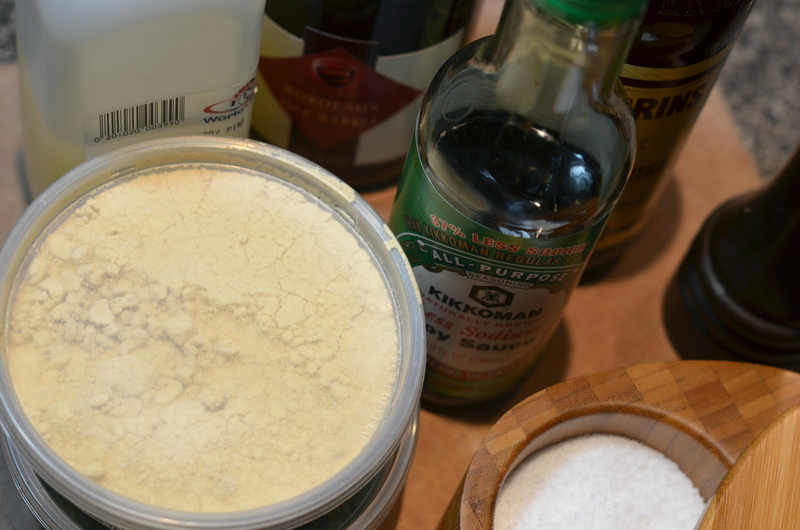 Unless you feel like chopping garlic before you’ve had your first cup of coffee, I suggest putting the marinade together the night before. Our steak marinated for about 12 hours but overnight is fine too if the pungent smell of Worcestershire sauce in the morning isn’t your idea of a pleasant olfactory wake up call. This was easily one of my favorite things to eat growing up. 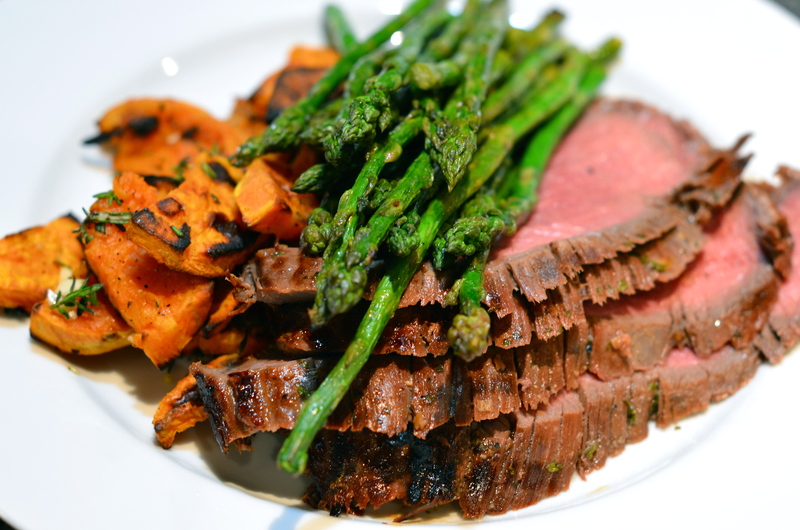 This steak is great as the main dish with some sweet potatoes and asparagus as evidenced by this post but it’s also terrific for a steak salad or even tacos. 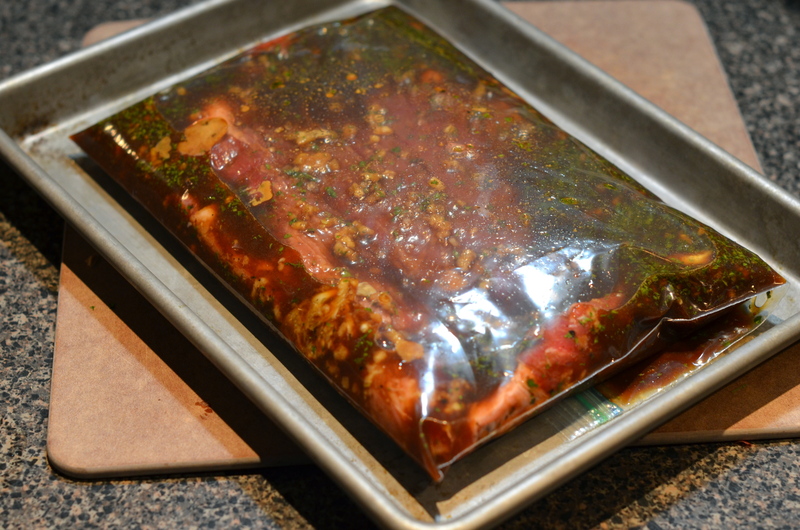 Combine everything into a large Ziploc bag or Tupperware and add your flank steak. Seal it up and put in the fridge for 12-24 hours. It’s like a beefy envelope of flavors. I flipped the meat over a couple of times so both sides were well-sauced throughout the day. Full disclosure here. I am not the griller in the house. I have a resident grill-master and as such, I can’t really tell you what should happen now other than you should find someone who will cook the steak for you. I will be dedicating a portion of the warm-weather months to learning how to grill but until then you’re on your own. I’m afraid of propane and fires like the husband is afraid of turning a burner onto high. Opposites attract, I guess. So, about 45 minutes before you’re thinking about sitting down to eat this steak, you can make some oven-roasted sweet potatoes if you’d like. Preheat your oven to 400°F. 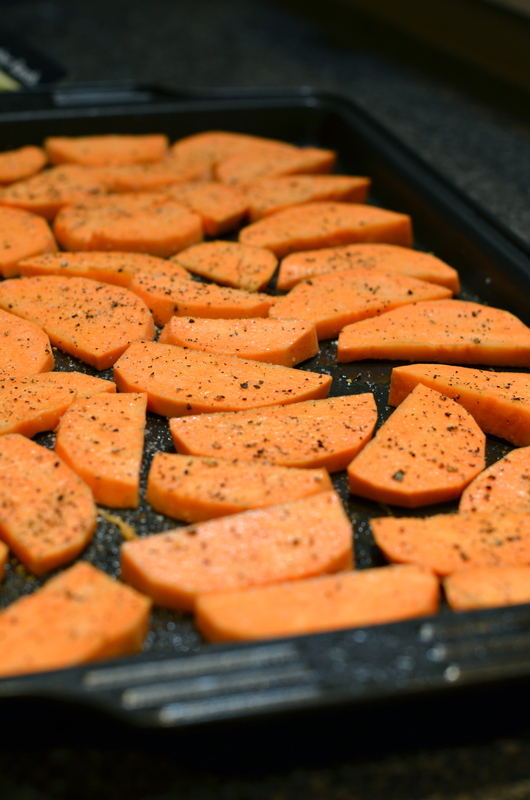 I have recently learned to like sweet potatoes but have an issue with how sweet they really are. 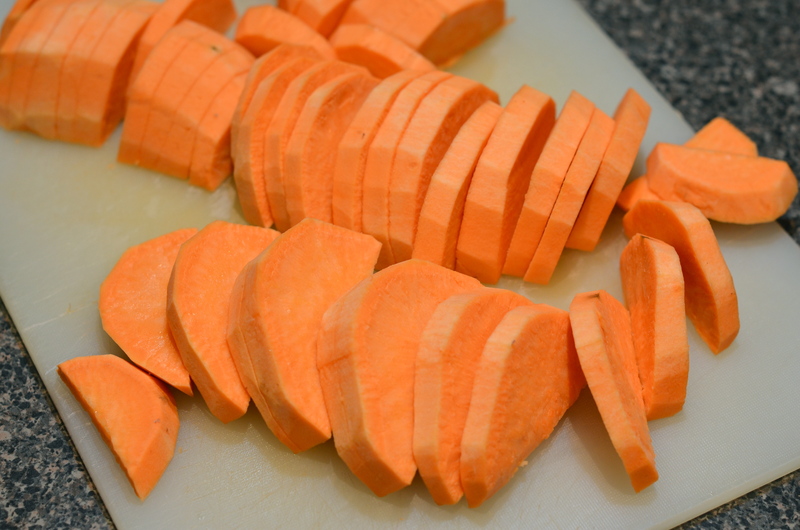 I’m much more of a salty person in general (both food-wise and most certainly personality-wise) and so I try to find ways to counterbalance the sweetness of these starchy orange treats. I like to roast them first and then toss them in fresh garlic, herbs and salt and pepper. 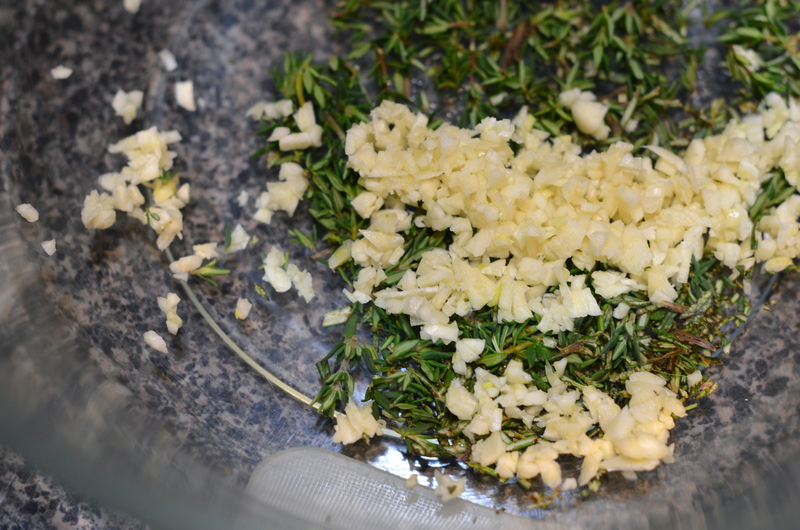 This keeps the garlic and herbs from burning in the oven and adds a lot of savory flavor at the end. Grab your taters and cut them into a shape of your choosing. I find that fry shapes tend to either fall apart when you try to toss them mid-cooking or the ends just burn up before the middles can get crispy. So this time I decided to try a what I have dubbed the truncated hexagonal prism. Or half-circle. I was much more of an algebra girl than geometry. 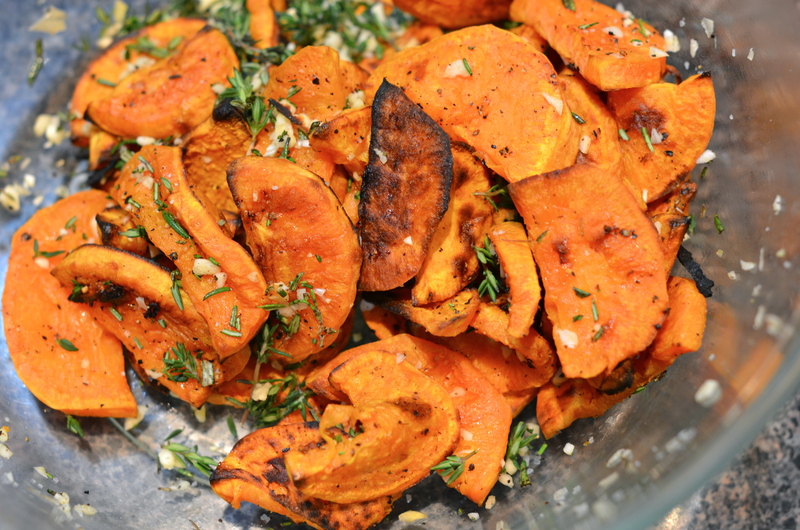 Toss these with some olive oil, salt and pepper and put in a single layer on a sheet pan. Roast for 30-40 minutes until they begin to brown and crisp up a bit. While they’re roasting, mince your garlic and herbs and put in a large bowl so you can toss everything together at the end. Look! The steak is done! What great timing. While the steak is resting (poor thing deserves a break), grab your potatoes out of the oven and toss in the herb and garlic mixture. The smell is fantastic. 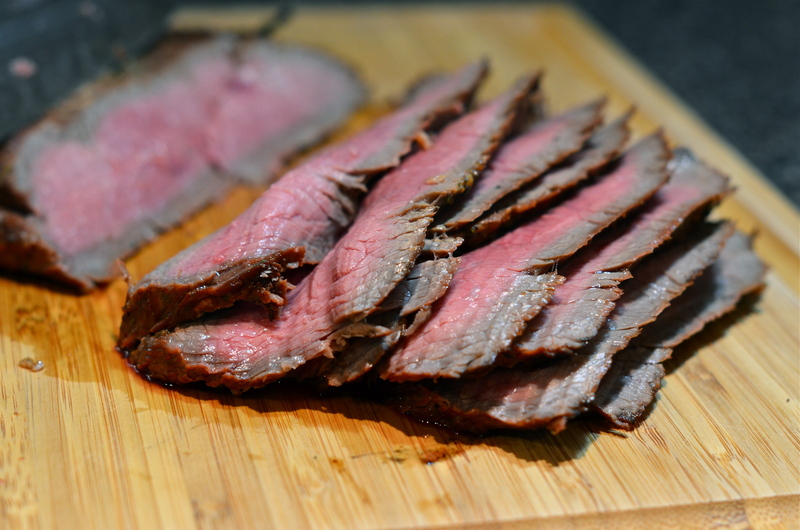 The appropriate slicing of a flank steak is important to the tenderness of your finished product. You want to slice it at an angle against the grain for ultimate chewability. It was at this point when the husband made sure to thank everyone who worked hard at this meal. First the cow, who made the ultimate sacrifice for the sake of our bellies. 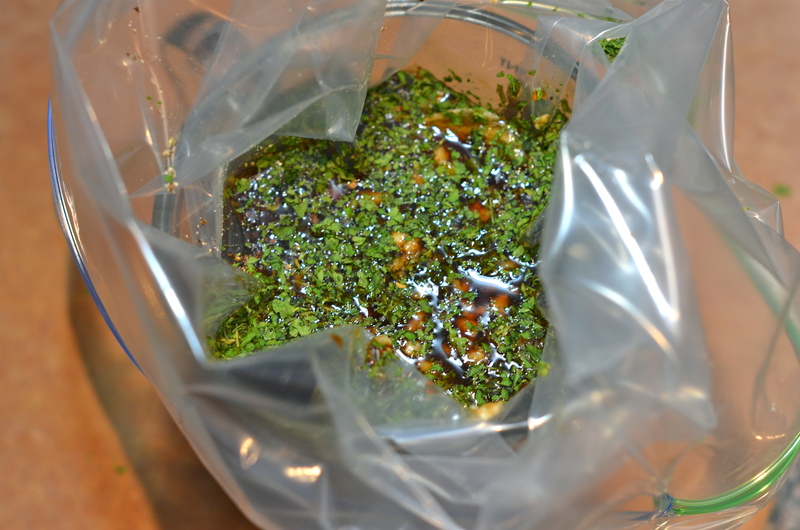 Next, the sauceketeer for best female performance in a marinating or saucing of a main dish. And finally, he took time to say a heartfelt thank you to himself to the excellent effort made in perfectly cooking the beef. You could almost see him mentally high-fiving himself. Dude also grilled some asparagus to go with all of this and it was good. He tossed it in some house vinaigrette first. Try that.